7 Small Shawls: T - 169 days and counting down. Today, between moments of packing club shipments up and making more pins, I got a little time with my preciousssssss. I just had to pet the yarn and play with the beads. It's been so long. Plus, I was aching to try out a new method for placing beads. 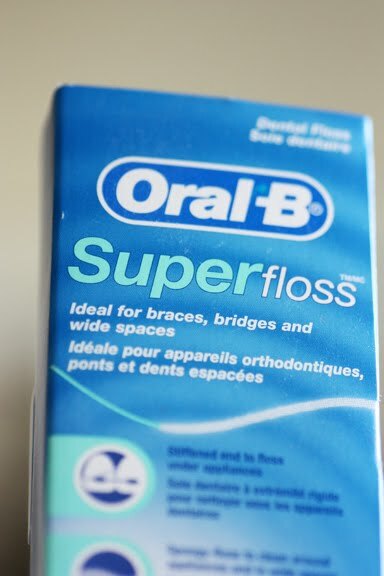 After hearing so many great things about it, I decided to try SuperFloss from Oral B. I had to track some down online first. Apparently, no one around here uses it. It comes in a box of 50 (I think) pre-cut pieces. Each piece has a stiff end (for threading through braces) and it's fairly easy to string beads on it. And even though I knotted the end, I really didn't need to, since the floss plumps up and the beads really stay put. To place a bead, stick the end of the floss through the stitch to be beaded and then move a bead up and run the thread back through the bead. Pull the stitch off the needle. 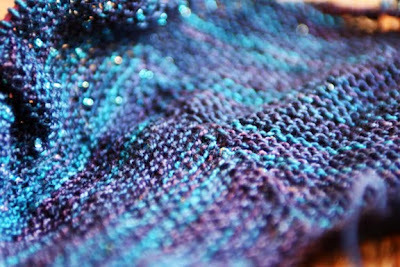 Settle the bead down on the stitch and replace it on the left needle. Work as usual. The best thing about this method is that you can keep quite a few beads ready to go on the floss. It seems like it would be great for travel. Well, now. It's back to work for me. Happy beading! Thanks for the review of that method. It's one I've not tried, being pretty happy with my teeny crochet hook too. I use the superfloss method because I am too impatient to stop and pick up a bead on the crochet hook every time. I tie a loop in the flossy end and slip it over my wrist like a bracelet with the beads hanging down. This works much better for me than the crochet hook, which I kept holding in my teeth in between beads because I would lose track of it otherwise! I also had some problems with only being able to snag one ply of my yarns with the crochet hook and generally making a royal mess of things. Sheer genius! I must try this method, thanks for the clear tutorial. Thanks for the tutorial, I agree, I like the crochet hook method better as well. But more than that, it was so nice to see the lovely blue yarn and beads being reported on again. Keep up the great posts and beautiful knitting! Thanks for sharing the technique even if it's not your favorite. I've always wanted to try beaded knitting, but have been intimidated by it up to now. But I should try it one of these days soon. It looks so pretty! I like the crochet method, too, but I'm willing to give this a try. It's amazing to me how clever knitters can be! Thanks for the tutorial! I've been idly wondering how it works - and now I know! I think I would generally prefer my crochet hook, but this method could work great for those cases where the yarn is a touch too thick for the hook, like CraftNinja said. It's great for the beading (but I have my crochet hook too) and I found it works great for the vent in my hearing aids. Knit, Romi, knit! We love seeing this beautiful blue-ness. I use the floss because when I first started beading I wasn't a great lace knitter so managing my knitting and a crochet hook and the beads--it just wasn't happening. Somehow I can keep track of the floss better. A lot depends on how you first learned. That almost always ends up being your first choice in just about any knitting technique. Clearly I'm never going to bead anything! That looks like a huge pain in the arse...Nice mani tho! Not seen that method before. Normally use crochet hook. May have to give this a try. Love the colour of the yarn. I am a newbie beader on lace. I tried the crochet hook method first and found that I was splitting the yarn and I was always afraid of losing the stitch when I grabbed it with the very small hook. I tried the Super Floss method and I like it because when you go back through the bead, the yarn is absolutely captured and cannot be lost. I also like it because I can easily string at least 30 beads on each piece of Super Floss and it is reusable many times. That said, now that I have some experience, I will try the crochet hook method again because the poking the hard end of the Super Floss back through the bead constitutes an extra step and hence is slower. But now I can bead and that is the important thing! I've only done beads once, and I liked my crochet hook for that. Great tutorial! I tried the crochet hook method after seeing your tutorial on it, and I liked the way it worked, but the hook kept splitting my yarn, so I went back to the floss. Wonder if I should have used a bigger hook? What a great idea! Thanks for posting it. Thanks for the photos! I'll have to go buy some of these floss! Thanks!